A Peruvian composer born September 4, 1981. Having begun his musical training at the National Conservatory of Peru, Juan Arroyo studied composition at the Bordeaux Conservatory then at the Paris Conservatory with Stefano Gervasoni, Luis Naon and Michaël Levinas. He also took part in the workshop of Voix Nouvelles in Royaumont as well as the composition course at Ircam. Committed to musical and acoustic research, he has explored the sounds of his native language, the sound scales of pre-Columbian instruments, blending western and Latin-American cultures in music that seeks sound realism. 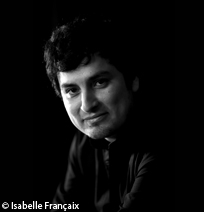 In search of new instrumental possibilities, he is interested in hybrid instruments (Smaqra, 2015, with the Tana Quartet) and was in residence as a composer at Ircam (2015). Electroacoustic and mixed works hold an important place in his output (Sumac for soprano, ensemble and electronics, 2012; Sama for flute, saxophone, percussion, piano and live electronics, 2013, commissioned by the French State; Sismo for saxophone, accordion, piano, violin, cello and amplification, 2014; Sonrio/Sollozo for cello, instrumental ensemble and two beatboxes, 2015). Juan Arroyo is also co-founder of the Peruvian Composition Circle (Circomper), of the Ensemble Babel (Bordeaux), of the Ensemble Eco (Lima), and artistic co-director of the Ensemble Regards (Paris).